Carousel Double Glazed Windows Ripon know that the whole way that a house is designed and constructed has changed a huge amount over the past few years.The use of double glazed windows has been one of the greatest improvements - adding style, increasing security and saving on energy bills. Carousel Windows is a family business comprising of three installation teams and three fabricators plus four sales and office staff. We have built up a successful business over the years from opening in 1991 and are now at a comfortable level - Large enough to cope & small enough to care. We've been providing double glazed windows in Ripon since we started our business twenty years ago. We manufacture a wide range of uPVC windows suitable for a variety of uses including refurbishment, renovation work and new build. Ask around and speak to some of our clients - we supply and install the very best uPVC windows and can guarantee that you'll enjoy the same professional and courteous treatment that all of Carousel Windows Double Glazed Windows Ripon customers have enjoyed since 1991. Carousel Double Glazed Windows Ripon - what is double glazing? Double glazing is a process wherein the window is made of two panes of glass with some space left in between them. The space allows air to be trapped between the two panes of glass, thus providing insulation. If it were just this, then condensation would form between the two panes of glass (contributing to the 'misting' that you sometimes see on older double glazed units), so Carousel Double Glazed Windows Ripon add a drying agent to ensure that there is no moisture trapped between the two panes of the glass. Once there's a hermetically sealed unit in your window space, it acts as a buffer unit between the temperature inside the house, and the temperature outside the house. In more modern windows, the gas argon is being used instead of air too, for better insulation. Carousel Windows Ripon operate from a 4,000 square foot factory and office complex, providing made to measure double glazed windows for families across Ripon. We're a family run business ourselves, and we understand the importance of security for your family. That's why we've been very busy making sure that all the latest security functions are available on the windows we supply our customers. So not only are our uPVC double glazed windows incredibly efficient, they're also highly secure. UPVC is also known as rigid PVC. It is Un-plasticized polyvinyl chloride and is used in the construction industry as a very low maintenance material. This material comes in a variety of finishes and colours, which include 'wood finish' with photo effect that can be used for windows and sills instead of painted window doors. 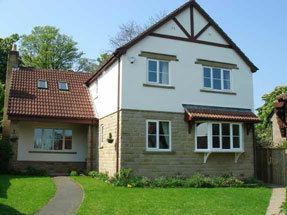 Carousel Double Glazed Windows Ripon use uPVC for weatherboarding, fascia and sidings as well as for window casements. UPVC is used instead of cast iron these days as well in drainage and plumbing and even gutters because it is highly maintenance free and will outlast traditional materials. Our windows will keep your home warm even in the most severe weather conditions, while at the same time provide it with a high degree of security. Our windows' 'A' rated Energy efficiency will reduce your heating bills, whilst integral gaskets and weather seals ensure draught free comfort for you and for your family. Why not pick up the phone and contact Carousel Windows Double Glazed Windows Ripon direct on 01274 522817 - you'll be glad you did.